The history of the All-Terrain-Vehicle as we know it today is closely tied with the history of Honda. Honda has been the world's largest motorcycle manufacturer since 1959. During the gas shortage in WWII, Soichiro Honda (Honda's founder) was unable to use his car so he had the novel idea of attaching a small engine to his bicycle. His idea gained widespread popularity and he established the Honda Technical Research Institute in Hamamatsu, Japan, to develop and produce small 2-cycle motorbike engines. Over 18,000 bicycle shop owners across Japan took part in the research, an initiative that helped bring together a nation torn apart by war. Thanks to this research institute Honda would pave the way for the modern ATV. 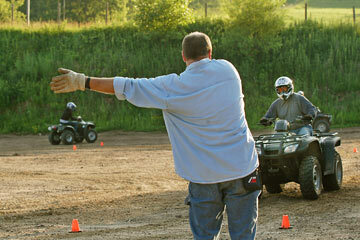 Here is how ATVs have evolved through time. 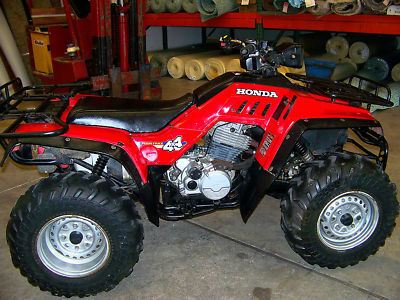 Though Honda would become the most popular ATV brand later on, the very first ATV was actually developed in 1961 in Toronto, Canada and called the Jiger. The Jiger was a 5 1/2 horsepower, 200 pound, 6-wheeled amphibious ATV, meaning the vehicle could travel on land and water. The first Jigers built for sale were all built to order. Prospects for the product included sportsmen and the military. 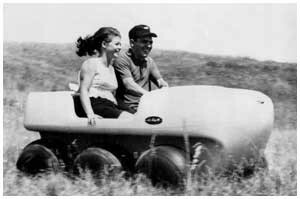 The Jiger was marketed as a "Go Anywhere Vehicle" and began being mass produced in 1965. Despite its popularity, the company’s financial troubles caused production to end in 1968. In 1967, American Honda asked one of its engineers, Osamu Takeuchi, for a new product that dealers could sell when motorcycle sales cooled off in the winter. Takeuchi drafted many design ideas, vehicles with 2 wheels, 3, 4, 5, and even 6-wheeled models like the Jiger. Out of all the designs, the 3-wheeled concept far outweighed two wheelers in snowy, slippery or muddy conditions and also provided better maneuverability. The challenge was finding tires that would actually get a grip on soft terrain like snow. Takeuchi’s tires would tack on another 2 inches to make 3 full 22-inch, low pressure balloon tires. Those tires allowed the vehicle to go places others couldn't, leaving little or no damage in their passing. 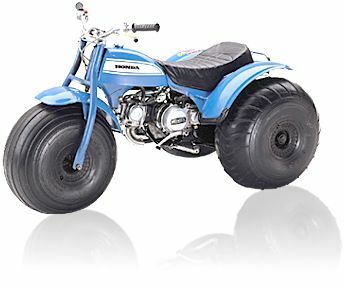 Honda brought the world’s first ever three-wheeled ATV or rather ATC (All-Terrain-Cycle) to the United States in 1970 and it was a hit. It was marketed and sold as a recreational vehicle and was famously portrayed in the James Bond movie Diamonds Are Forever, as well as popular TV shows like Magnum P.I and Hart to Hart. The three-wheeled US90 had a seven horsepower engine and sold for $595. 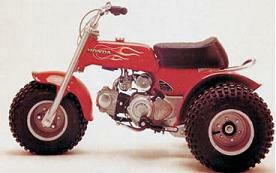 Honda released the ATC 70 a smaller version of the ATC 90 intended for youngsters. Though ATVs were originally targeted towards sportsmen until the 70's gas crunch when customers began purchasing them as utility vehicles for agriculture and farming purposes. This was because ATVs cost exponentially less than a tractor, and guzzled only 8 percent of the fuel needed to feed a tractor. Honda's first official ATC racing participation came in the 1981 Parker 400 race held in the Arizona desert where it came in first. With the widespread popularity of ATVs also came an increase in accidents and injuries, particularly among adolescents and children. This prompted an investigation by the Consumer Product Safety Commission (CPSC) in 1984. By 1986, their statistics suggested that most ATV accidents were due to improper rider behaviour rather than actual vehicle design. Nevertheless, on April 28, 1988, U.S. ATV distributors signed a 10-year agreement with the CPSC called the Final Consent Decree upon which the ATV industry made a $100 million commitment to expand existing ATV safety courses and programs. Among the many components of this agreement, ATV distributors had to offer free training and training incentives to owners and purchasers of new ATVs. This agreement also marked the end of three-wheelers on the ATV market. 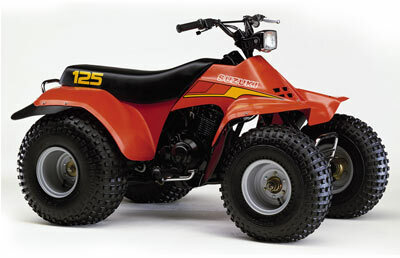 In 1982, Suzuki introduced the first 4-wheeled ATV called the QuadRunner 125 (pictured below). It came equipped with an odometer, five forward speeds and reverse! This quad paved the way for the 4-wheel ATV revolution. 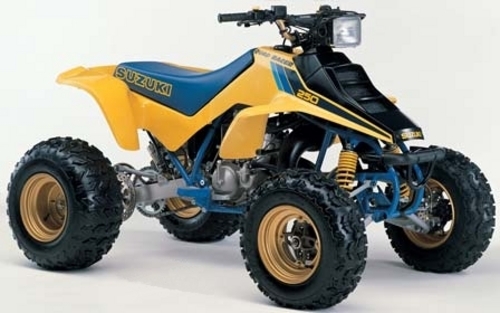 In 1985, Suzuki took the ATV world by storm when it introduced the first high-performance 4-wheel ATV, the Suzuki LT250R QuadRace (below). Meanwhile, Honda was working on its own 4-wheeled concept. After scrutinizing research, testing the prototypes with riders wearing 50-pound instrument packs that recorded information on every aspect of the machine’s operation, they unleashed their beast in 1984 known as the FourTrax TRX250R (below). 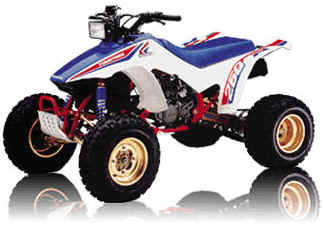 To this day, the FourTrax 250R continues to win awards for its performance. 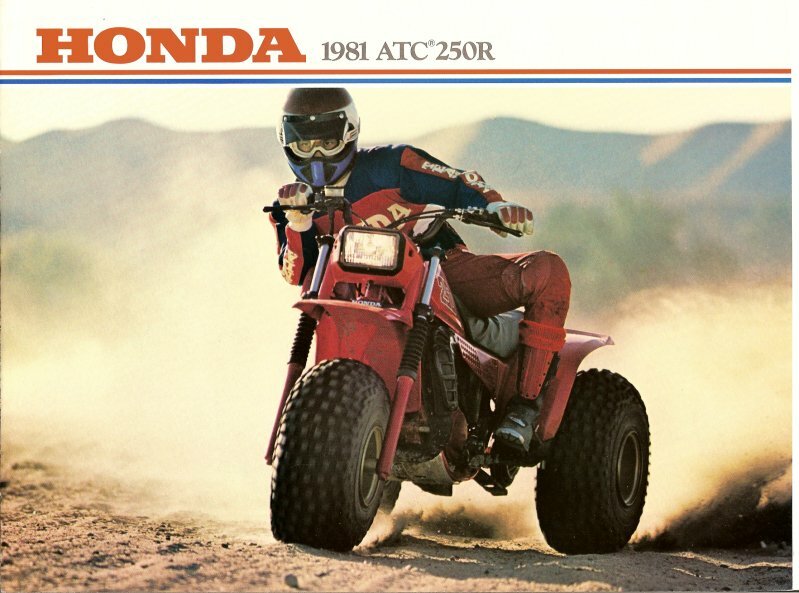 1984 was Honda's biggest sales year for ATVs. 370,000 units were delivered making up 69 percent of total ATV sales in the U.S. that year. 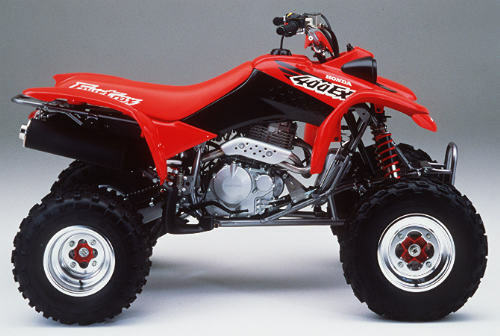 In 1986, Honda unveiled the first four-wheel-drive ATV, the FourTraxª 350 4x4. For its grand unveiling it was lowered from a helicopter to show all four wheels moving under their own power. 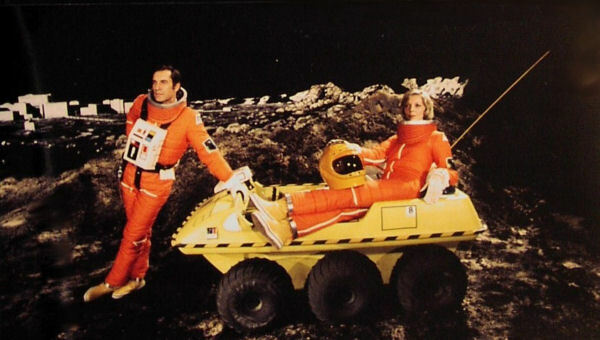 This model would ultimately become the most versatile and popular ATV in history. ATVs have become more than recreational vehicles and have stood the test of time as vital tools in a wide range of industries from farming, agriculture, hunting, industry, ranching but also an important means of mobility for people with disabilities. Interestingly, many of the uses and application for ATVs have sprung from their owners, who have helped shape their growth and design along the way.